“I am the beauty of speed” has been updated to “I am commanding speed.” Gotta love those marketing departments. Overall, the camera is pretty much the same size, though it has grown in depth to accommodate the slight hand grip and tilting LCD. Gone are the garish color options, with only white, silver, and black now available. One unanswered question concerns the sensor. The specs on the sensor match Sony’s 1” sensor, not Aptina’s. Aptina sold last year to a company that isn’t really interested in camera sensors (they are interested in automotive use of imaging sensors), so I doubt that this is an update to an Aptina-produced sensor, but rather a switch to Sony's. If so, that implies about a third of a stop change in ISO response and a clear improvement in dynamic range at base ISO, which will help with shadow noise. That said, those expecting a large change because of the BSI (back side illumination) aspect of the sensor are probably going to be disappointed. If this is the Sony sensor in the J5, then it’s a clear step forward in image quality, but a modest step. Things that serious photographers might find still missing are no hot shoe, no EVF option, no bracketing, no CLS flash control, a not-very-usable 4K video mode, plus the continued use of the microSD slot. 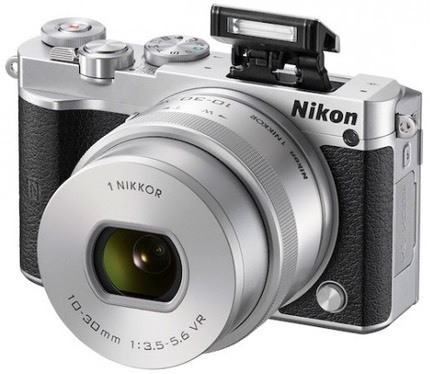 The change in batteries has to bother some loyal Nikon 1 users, too. Still, overall one can’t ignore the fact that the J1 to J5 progression has slowly rid and hidden the camera of low-end, totally automatic features and pulled more and more serious shooter features to the front and center. The J5 is much more like the camera the J1 should have been in the first place. Interestingly, so is the price: US$500 with kit lens seems much more like the right starting price for a competent, small mirrorless camera. But we still really don’t have a full set of lenses for the Nikon 1. No new lenses were announced, nor was a road map announced by Nikon. I do note that many of Nikon’s sample photos were taken with the 18mm and 32mm primes. Maybe they have finally figured out that there’s an advantage to putting a really good lens on the front of these Nikon 1 cameras. We still need a couple of better fast wide angle primes, and even something like a fixed f/3.5 or f/4 zoom or two would help (though most would want an f/2.8 zoom). 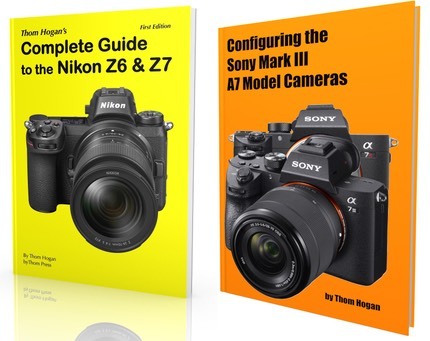 So here we are four years and eleven cameras into the Nikon 1 experiment, and things are finally starting to make a bit of sense. The price/performance/features matrix actually looks reasonable for a change. Could it be? Could making a decent, straight-forward camera with decent performance at the right price really be a better option than gimmicks? Nah. That can’t be right.